Bronwyn "BitsyWyn" Whalen hasn’t set eyes on the red dirt of Magnolia Creek, Alabama, for fourteen years—not since her mama died. But with her brother, Patrick, imprisoned for the murder of her childhood best friend, and her eccentric father, Jackson, at his wits’ end while her eleven-year-old niece, Byrd, runs wild, Bronwyn finds herself once again surrounded by ancient magnolia trees and the troubled family she left behind. She becomes immersed in a whirlwind of mystery and magic as she tries to figure out what really happened that fateful night her friend died. 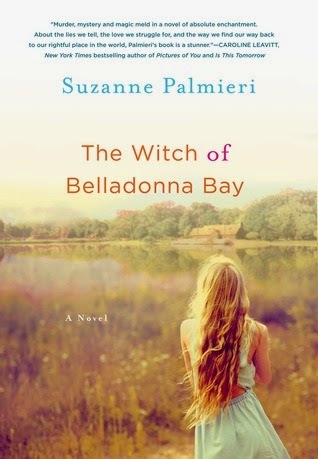 And as her bond with Byrd deepens, Bronwyn must face the demons of her past in order to unravel her family’s uncertain future.In Suzanne Palmieri's thrilling new novel, The Witch of Belladonna Bay, readers will learn if love and magic are enough to bring a broken family back together. The Witch of Belladonna Bay whisked me back in time to when I was reading my mom's coveted gothic novels. That's the sort of feel I got from the mesmerizing detail affixed to the scenes in this page-turning suspense with a touch of paranormal. It took me a while to connect with the main character, Bronwyn, but I put that off to simply not having walked in her shoes. She is a very eccentric character with quite a few strong attributes, not to mention, she's also human and has those feelings as well. My mid-way through the novel, I was captivated. Not only with the twists and turns that Bronwyn and her family were dealing with, but also the strength she had to deal with them all. An unsolved murder, a touch of 'shine', coming home again and family are just the tip of the iceberg in this charming, southern mystery with a touch of paranormal and romance. I'd definitely read another of Suzanne's books - it was really good! I enjoyed your review and think this book would be enjoyable reading. If you get a chance, please stop over at my blog and say hi.